Happy Chinese New Year to my worldly friends! Some may know this as Lunar New Year's Day or Spring Festival. Come to find out - it is The Year of the Rooster! And guess what? Stampin' Up! happens to offer a free stamp set just in time! The inspiration for my card was the Stampin' Up! designer's card found on page 16 of the SAB catalog. I just loved the idea of the stacked chickens. The card base is a full sheet of Crumb Cake Card Stock, cut in half vertically, 8 1/2" x 5 1/2", scored at 4 1/4". On the front section only, I stamped the honeycomb image from the Butterfly Basics stamp set (Item #138813/w, #138816/c, #137154/p, AC p. 113) around the outer edges. 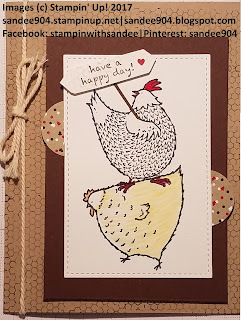 For stamping the chicken images, you will need a piece of Whisper White Card Stock at least 4 1/4" by 3". I used a small amount of the Daffodil Delight pencil from the new Watercolor Pencils (Item #141709, OC p. 24) along the outer edges of the lower chicken and pulled the color around using a Blender Pen (Item #102845, AC p. 180). Works beautifully!, but don't let the paper get too wet. The Pumpkin Pie pencil for her beak and such - too small for blending. The upper chicken is practically naked except for the beak, again Pumpkin Pie, and I used a Real Red marker from the Brights Stampin' Write Markers (Item #131259, AC p. 171) for the tuft of hair. Alternatively, you could use the Real Red pencil, or pull some ink from a Real Red Classic Stampin' Pad (Item #126949, AC p. 171) with the Blender Pen. I used the largest square in the new Stitched Shape Framelits Dies (Item #145372) and magically extended the square into a rectangle by placing the top cutting pad so that it only cuts three (3) sides (approximately three quarters of the way down), then flipping everything around and running it through again cutting only three (3) sides - actually tricking a square into becoming a rectangle. Quite ingenious whoever thought that one up! I hope you don't mind that I used a smidgen of my favorite retired Candy Cane Lane Designer Series Paper from the 2016 Holiday Catalog for the half circles (1" Circle Punch, Item #119868, AC p. 187). Then layered on a piece of Chocolate Chip Card Stock cut 3 1/4" by 4 3/4". The height may need some adjustment depending on how high your chickens end up. To finish this card, I stamped the "have a happy day" sentiment in ink from a Chocolate Chip Classic Stampin' Pad (Item #126979, AC p. 170), punched with the Classic Label (Item #141491, AC p. 186) a bit smaller by double cutting the sentiment. Any small heart will do to accent the sentiment on the sign, but I happened to be making Valentine's Day cards too so I used just one teeny tiny heart from the row of 8 hearts image from the Sealed with Love stamp set (Item #142815, OC p. 15). The bow is made using the Very Vanilla Thick Baker's Twine (Item 138411, AC p. 179). The description looks rather daunting, but since the next Year of the Rooster on the Chinese Zodiac will not be until 2029, this card is totally worth your effort. Check back again soon for our Valentine's Day card and treat bag using the January Paper Pumpkin kit. While on the subject of Paper Pumpkin, during Sale-A-Bration, the 3-month subscription price is discounted and you can earn a free SAB product too. 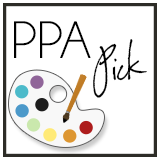 And another way to try out Paper Pumpkin is to join my team during Sale-A-Bration. 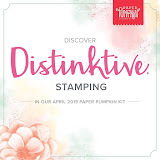 The cost is $99 for $125 of any product you chose, plus two (2) free stamp sets, a free Paper Pumpkin kit, and free shipping. Wow, right!! Also, if you are interested in a workshop tailored to The Designer Tin of Cards Project Kit (Item #141651, AC p. 160), message me for details.